The 2017 Cadillac Escalade is an excellent SUV, and its interior is one of the best executions of Cadillac design at current. The Escalade has always felt worthy of its price tag, and like it or not, it truly is Cadillac’s status symbol. While it looks properly posh, we do think it’s a bit… overboard. The custom leather, done in multiple textures, looks plump and luxurious, but also busy, distracting from what makes the Escalade’s factory interior design so pleasant. 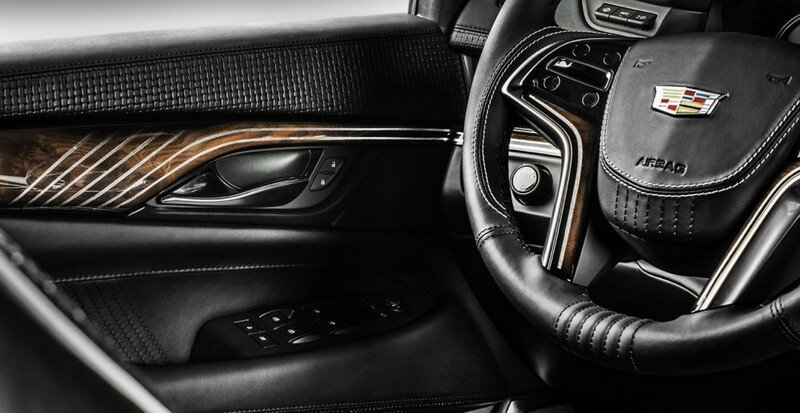 Carlex has even wrapped the steering wheel and dashboard in the same stitched leather. We’re sure it’s a nice place to be, but the Escalade isn’t at the top of our list when it comes to certain Cadillacs in need of an interior redesign… *cough* ATS *cough*. Next story Community Question: Should Chevrolet Chase Mustang Hybrid With A Camaro Hybrid? Cadillac corporate should do something similar from the factory although maybe a little more tasteful. Make a trim and equiptment level higher than the current generic sounding ‘Platinum’ edition which Ford and Nissan also use as their higher trim level. I am not sure what they should call it, maybe a name from the past like the Fleetwood, Brougham or Deville Edition. They could come up with a new name. It doesn’t really matter. There are clients that will pay extra for vehicles that are unique and a cut above the vehicles their neighbors/co-workers have. Right now they can go to BMW, Mercedes, Audi and others to get that. Jaguar use to have the Vanden Plas edition and Mercedes has Maybach-Pullman. Why shouldn’t Cadillac have something similar? An interior like this is worthy of the names Fleetwood, Brougham, or Biarritz. Love it! Get these guys a CT6 stat!!! Show those interior designers how it’s done!!! And while they’re at it, have them take care of the ATS also! CT6 and XT5 for sure. The ATS and CTS are close to redesign anyway so see what happens there first. Sometimes to much of a good thing is just to much . What Cadillac should do to their Best in class Escalade is get rid of all plastic pieces . With a SUV selling for 100 grand it deserves better . Just that little extra attention to an already beautiful interior would complete the interior enviroment . Less garish (as someone said below) works for me. My point is that there should be a trim and equiptment level higher than the Platinum. It should be excessive and opulent but yes, well done, cohesive and not ‘garish’. I really wish there was an aftermarket company that made knobs for Cadillac. The by far would be the greatest improvement to the interiors. And all this comes from a company that is located in the middle of Europe but you won’t find there a single Cadillac dealer while Infiniti has 4 high rent dealers in Poland! Pretty garish. Sometimes less is more. The Escalade’s interior is beautiful as is, particularly the Platinums. However, Platinum needs few more interior choices to generate more sales. In-spite of being on the market for the 3rd year in current cycle, the vehicle is still showing strong sales that the current Cadillac models can’t match in volume except for XT5.